Wide paved pathways and park roads along wooded forests, along with the breezes coming in off Lake Superior, form much of the scenic backdrop at the annual Marquette Marathon, Half Marathon, 5K & Kids Run, which is set for its 10th running in the late summer of 2018 here along the shores of Michigan’s Upper Peninsula. This race, which is a Boston Marathon qualifying race for those looking to run the full marathon, is set to run on an all-new course this year, one that moves the starting line from its former home in Presque Isle Park to the Michigan Iron Industry Museum in nearby Negaunee. From there, runners make their way along a combination of a few roads and trails before turning onto the Iron Ore Heritage Trail, a 47-mile-long running, walking, hiking, inline skating and biking trail that serves as a monument to this region’s 160-plus years of mining history and stretches between the towns of Chocolay and Ishpeming, with paved, crushed granite and limestone surfaces. 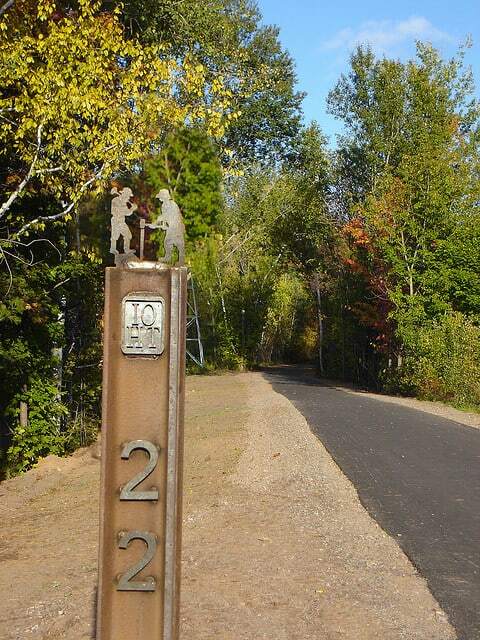 Once runners make their way from the museum onto the Iron Ore Trail, they’ll spend roughly the next 9 to 10 miles on the trail heading east toward Marquette. The course is a fast one, flat for about the first 5 miles and then unfolds along a gradual downhill slope for the next 5 miles after that, dropping roughly 735 feet overall by the time runners reach the finish line. Between mile markers 9 and 10, runners will leave the Iron Ore Trail and turn onto 3rd Street and Spring Street, where they’ll pass by the Ore Dock Brewing Company on their way to rejoining the trail where it parallels Lakeshore Boulevard. By this point, the race has flattened out to nearly its lowest point, and will remain mostly flat for the last few miles. Miles 10 through 13 unfold with stretches through Ellwood Mattson Lower Harbor Park and past the Marquette Maritime Museum and the Marquette Harbor Lighthouse, looking back at you from the peninsula sticking out in Marty’s Cove. The next couple of miles feature beautiful views of the Lake Michigan shoreline as you run past Picnic Rocks and Shiras Park, and then pass what organizers say is the world’s largest dome, the Northern Michigan University Superior Dome. After that, there’s just over a mile left as runners skirt the edge of the NMU campus along Fair Avenue and turn onto 3rd Street, where they’ll head south to cross the finish line at 3rd & Michigan Street. Located along the shores of Lake Superior, along the northern part of Michigan’s Upper Peninsula, the city of Marquette typically experiences mild to moderately cool and occasionally cold conditions in the late summer, and sees some of its heaviest rainfall on average during the month the race is held. On the day of the race (Aug. 31), the average low is 49°F and the average high is 69°F. See the race route map for the Marquette Half Marathon here. To reserve your spot in the 2019 running of the Marquette Marathon, Half Marathon, Relay, 5K or Fun Run, register online at RunSignUp.com here. Ever run in the Marquette Half Marathon? Share your impressions here, or post your review in the Comments box below. Best kept secert course in the Midwest!